Set upon the Svart’s northern bank, High City rises above the stink and muck of the rest of Languard by dint of a series of bluffs rising from the river’s waters. Here dwell the great and the good (or perhaps just the wealthy) of Languard. In High City, the streets are cleaner and broader, the houses are of stone and slate, and the folk are wealthier and healthier. The concentration of so much wealth and power should attract thieves and other near-do-wells. However, given the large numbers of men-at-arms, bodyguards and other armed personages serving the folk dwelling here it is a brave, stupid or superlatively skilled burglar who works in High City. All Ashlar’s noble families maintain townhouses in High City for when family members must visit the city on business (or pleasure). Such places are staffed permanently by trusted servants and a small garrison of men-at-arms to discourage theft. Fringed by ancient oaks planted long ago, Abbey Road runs in the shadow of the city’s north wall. It leads directly to Watcher’s Spire and by local ordinance must be kept clear of rubbish, debris and stalls so that the abbey’s garrison can move quickly and freely to Duke’s Gate and Vonya’s Span. Running passed High City’s docks, Broad Street is a bustling centre of commerce for business grown too successful for High Market. Here, shops and workshops catering to the residents’ expensive tastes crowd closely together. Like many of Languard’s streets and roads, Market Street is imaginatively named—for it leads directly to High Market. Market Street is one of the few roads in the High City where businesses may display their wares on the street. Consequently, many porches or capacious awnings shelter tables, display cases and the like crammed with items for sale. Children and apprentices work hard to lure potential buyers into examining the goods therein. 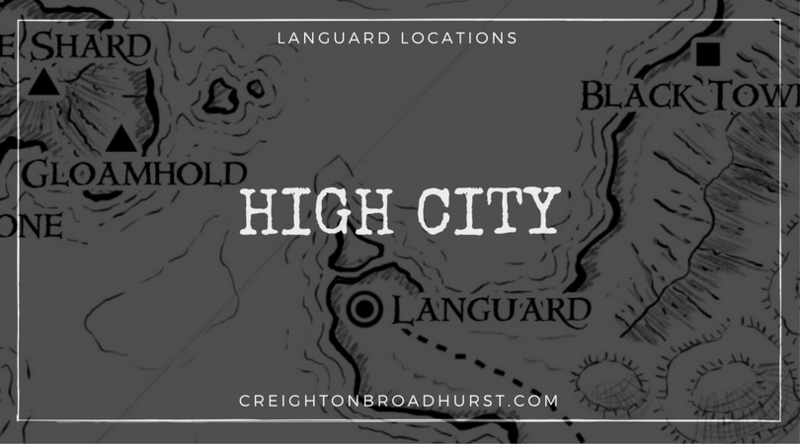 Although it is a relatively safe place, adventure can still be found in High City. As they wander High City’s streets, the party (literally) bump into Jorma Outila, trusted servant of Wido Gall (the ruler of Dulwich), and his bodyguard. Jorma is imperious and demands an apology. If such is not readily forthcoming, he demands to know their names. In the future, he revels in any opportunity to repay their slight.